Can’t snorkel but still would like to see the fabulous underwater marine life off the coast of Riveiera Maya? Google has found a solution for you. Google has added two new underwater destinations in Mexico to its Google underwater Street View scenes. According to Techcrunch, Google is collaborating with the Catlin Seaview Project to capture the imminent danger to the coral reefs around the world using high-definition underwater photography. 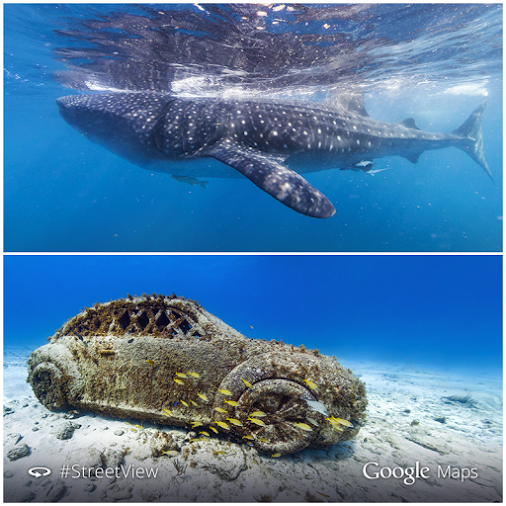 The new undersea images from around Isla Mujeres and Cancun in Mexico reveal a whale shark swimming near Isla Contoy and a sunken car teeming with life which is one of the item of the famous underwater museum at Isla Mujeres. The underwater Street View was first started in 2012. Now Google has added many locations like reefs around Australia’s Great Barrier Reef, the Philippines, Hawaii, locations off the coast of Bermuda and Galapagos Islands. The divers typically cover about 2 kilometers and take between 3,000 and 4,000 images per dive during their expeditions and the team goes about three dives per day, each of which lasting for about an hour. The latest addition to Street View is the shoreline of San Francisco as seen from the water, the report added.